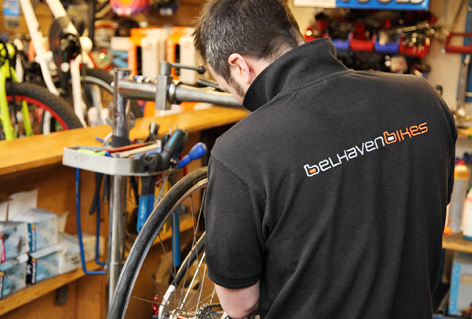 Belhaven Bikes was born in 2005. Based in Dunbar, East Lothian, we serve our community and beyond...whether you want to cycle, skate or scoot. We love to give you a wide choice so all tastes and budgets are catered for. Our honest, professional service, approved by the Association of Cycle Traders, can help you choose the right bike or product for you. We believe that bikes should be properly fitted in store so you know you are getting the right bike and as part of our service, we ensure your bike is fully built for your collection/delivery. A free 6 week service is included and, of course, a full warranty. A wide selection of bike brands such as Dawes, Merida,Genesis, Ridgeback, Cervelo, Kuota, Haro, Premuim and BSD are available alongside an array of parts, accessories and clothing. From balance bikes for children starting out, to BMX, commuter, mountain bikes, road bikes and specialist...check out our website which shows you the wide range. We are also part of the Government's 'Cycle to Work' scheme where you can save up to 40% on a new bike and accessories while spreading the cost. Alternatively, we offer Finance from 0%. MADD, Grit, Micro, JD Bug and Crisp scooters are on display in store and online, along with a huge variety of parts to choose from which also includes manufacturers such as Blunt, Lucky and Sacrifice. We offer repairs in our Workshop and should you need your bars cut to size, we can handle that too. Skateboards from the likes of Santa Cruz, World Industries and Creature are available along with parts from companies such as Bones and Independent - we also carry MOB grip tape. If you fancy something more tailored for you, then we do custom builds on bikes, scooters and skateboards. Show off your individuality and custom your ride! You can trust us with your bike. Whether it's just a wee tune-up or a bit more work to get you back on the road again. Our reliable, Cytech Accredited workshop offers servicing, repairs, free safety checks and wheel building (we're experienced with motorbike wheels too). Courtesy bikes are subject to availability and bookable in advance. Cycle Hire is available all year round and if by chance you don't have a bike just now or perhaps you are holidaying in East Lothian then we have some bikes to get you out on the open road. Dawes Saratoga, ladies and gents, comfort mountain bikes are available, which are fitted with full mudguards and a rear rack. The package includes, bike, pump, spare tube, tyre levers and an East Lothian Spokes Map.